Here’s a fun idea to welcome staff to your company, as a seminar table gift or conference or simply just as a fun giveaway. 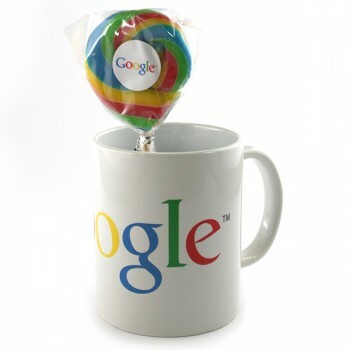 The mug was custom printed with the client logo, then we inserted a lollipop into the mug, and added a special card welcoming the recipient. A simple idea that amply demonstrated the “googliness” and fun attitude that prevails over at the Google office. Other ideas that work well with this theme could include a custom made plush toy inserted into a printed cup. At Eventus Gifts we are able to custom pack almost any group of items with your very own branding prominently displayed – if you would like some ideas, or to have a brainstorming session, why not contact one of our professional consultants right now?